Verbs are also said to be either active (The executive committee approved the new policy) or passive (The new policy was approved by the executive committee) in voice. In the active voice, the subject and verb relationship is straightforward: the subject is a be-er or a do-er and the verb moves the sentence along. In the passive voice, the subject of the sentence is neither a do-er or a be-er, but is acted upon by some other agent or by something unnamed (The new policy was approved). Computerized grammar checkers can pick out a passive voice construction from miles away and ask you to revise it to a more active construction. There is nothing inherently wrong with the passive voice, but if you can say the same thing in the active mode, do so (see exceptions below). Your text will have more pizzazz as a result, since passive verb constructions tend to lie about in their pajamas and avoid actual work. Take the quiz (below) as an exercise in recognizing and changing passive verbs. When it is more important to draw our attention to the person or thing acted upon: The unidentified victim was apparently struck during the early morning hours. When the actor in the situation is not important: The aurora borealis can be observed in the early morning hours. We use the passive voice to good effect in a paragraph in which we wish to shift emphasis from what was the object in a first sentence to what becomes the subject in subsequent sentences. The executive committee approved an entirely new policy for dealing with academic suspension and withdrawal. The policy had been written by a subcommittee on student behavior. If students withdraw from course work before suspension can take effect, the policy states, a mark of “IW” . . . .
Verbals or verb forms can also take on features of the passive voice. An infinitive phrase in the passive voice, for instance, can perform various functions within a sentence (just like the active forms of the infinitive). Subject: To be elected by my peers is a great honor. Object: That child really likes to be read to by her mother. Modifier: Grasso was the first woman to be elected governor in her own right. The same is true of passive gerunds. Subject: Being elected by my peers was a great thrill. Object: I really don’t like being lectured to by my boss. Object of preposition: I am so tired of being lectured to by my boss. With passive participles, part of the passive construction is often omitted, the result being a simple modifying participial phrase. [Having been] designed for off-road performance, the Pathseeker does not always behave well on paved highways. Voice distinguishes an active verb phrase from a passive one. It makes possible to view the action of a sentence in two ways. 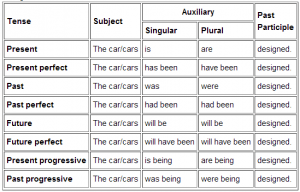 The active passive relation involves two grammatical levels: the verb phrase and the clause. The active-passive correspondence: Changing from active to passive involves rearangement of two clause elements: The active subject becomes the passive agent, and the active object becomes the passive subject. And the preposition BY can be introduced before the agent. John (active subj.) admired(active verb) Mary. Mary(passive subject) was admired(passive verb) by John(by phrase agent). 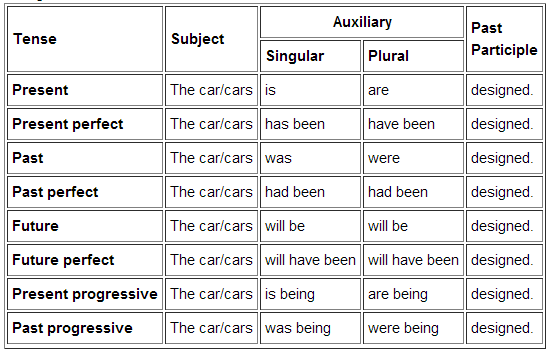 The passive auxiliaries BE and GET: The passive auxiliary is normaly BE. We may use GET but it normaly used in case in consructions without animate agent: The cat got run over by a bus. or James got beaten last night. But using it with animate agent is also possible: James got beaten by a gang. This GET passive is avoided in formal style. The house is getting rebuilt. Sounds unfamiliar. But these sentences mustn’t be confused with passive sentences. These we also call PSEUDO- PASSIVES. GET puts the emphasis on the subject rather than the agent in both cases (copu. and passive). Get passive often reflects an unfavourable attitude towards the action: How did that window get opened. Five kinds of voice constraint: verb, object, agent, meaning, frequency of use. Verb constraints: a/ active only: copular and intransitive verbs and the so called “middle verbs do not occur in some senses in passive: have, lack, The auditorium holds 5000 people, The dress becomes her, resemble, suit. But stative verbs of attitude can occur in the passive: He is wanted by the police. In some cases only the passive is possible: John was said to be good teatcher. They said him to be a good teatcher (difference). Prepositional verbs. In passive they are normally verbal idioms. The enginneers went very carefully into the problem. becomes: The problem was carefully gone into by the engineers. (no sense with tunnel). Object constraints: Transitive verbs can be followed by clausal or phrasal object. With clauses as objects the passive is restricted in use: Noun phrase as obj. : John loved Mary, Mary was loved by John. Clause as object: Finite clause: John thought that she was attractive. we dont say: That she was attractive was thought by Tom. In Nonfinite clause: infinite: John hoped to meet her. we dont say: To meet her was hoped by John. John enjoyed seeing her. we dont say Seeing her was enjoyed by Tom. Constraints occur in case of reflexive, reciprocal and possessive pronouns. himself could be seen, each other could be seen, my hand was shaken by the man -> these are all wrong. And passive is not used for idioms in which the verb and the object form a close unit. The ship set sail and not Sail was set. Agent constraints: In most cases the agent is missing when it is irrelevant or missing. The Prime Minister has often been criticized recently. or where the agent is left out as redundant. Jack fought Michael last night and Jack was beaten. So from the passive we cant conclude to the agent of the active in most cases. Meaning constraints: The meaning may differ in act and pass. John cannot do it. where it expresses ability, and It cannot be done by John, where it expresses possibility. or Every schoolboy knows one joke at least, which means Every schoolboy knows at least some joke or other. and One joke at least is known by every schoolboy, which means that there is one particular joke that is known to every schoolboy. Difference in meaning has also been noted where both subject and object of the active sentence are generic: Beavers build dams and Dams are built by beavers. (universal interpretation in the first case which doesn’t work in the second case). Frequency constraints: Stylistic factor determines frequency to a great extent. (impersonal vs. personal style). The passive gradient: The grade of how strong the passive is. Central passive or true passive: The violin vas made by my father . and The conclusion is hardly justified by the results. These sentences have a direct active-passive relation, but the first has a personal, the second has a nonpersonal agent. Semi passives: Both verbal and adjectival properties. a) coordinating the participle with an adjective. We feel rather encouraged and content…. Leonard seemed very interested in and keen on linguistics. In such adjectival uses of the past participle, it is rare to have a by phrase expressing the agent, but sometimes they occur: I feel rather let down by his indiference. Prepositions however can introduce agent-like phrases. (about,at,over,to,with) We were all worried about the complication=The complication worried us all. Pseudo passives: these have no active form and no possibility of agent addition: The building is already demolished. Their verb+ed participle recommends as passives. In terms of meaning they of course have an active equivalent. In 1972 the democrats were defeated. Has dynamic and stative meaning. They occur with current(be,feel,look) and resulting(get,become,grow) copular verbs.